> Nov 16, 2014 - a complete page redesign and ownership switch. > Feb 9, 2013 - SP V3 design update. > Dec 2, 2012 - regular updates. > Sep 18, 2007 - pictures attached/detached. > Oct 23, 2005 - Pictures attached/detached, Summit Views chapter created. 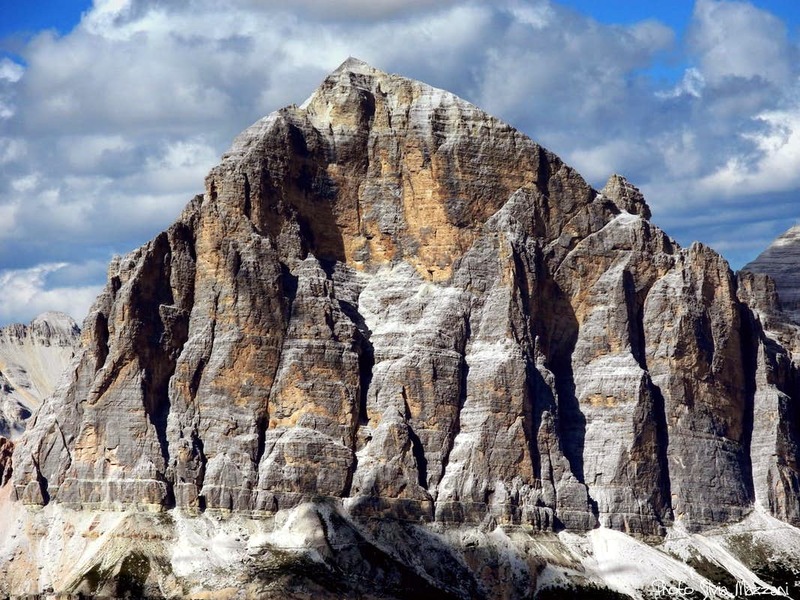 The Tofane group is an impressive solid and wide massif, one of the most distinguishing in Dolomites, consisting of three main peaks, which are quite of similar altitude: Tofana di Mezzo or Tofana II 3244 m, Tofana di Dentro or Tofana III 3238 m - closely linked - and Tofana di Rozes or Tofana I 3225 m. Tofana di Dentro is the Northernmost summit, Tofana di Rozes the Southermost and Tofana di Mezzo, the highest one, lies in the middle. The whole massif is located West of Cortina d'Ampezzo, so according to classification we use here on SP it belongs to Cortina Dolomites. On the South the border of Tofane group is the valley which runs from Cortina d'Ampezzo to the Falzarego Pass (2105 m). On the East the massif ends deep down in the Ampezzo valley. And on the Western side the massif is divided from the Fanis Group by the valley of Travenanzes. 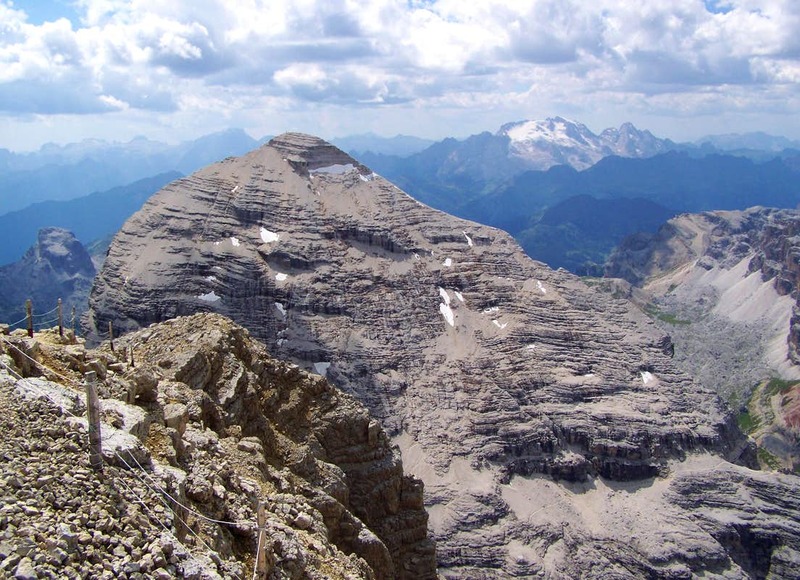 Geologically the massif of Tofane is made up of countless rocky banks - slightly inclined towards the North - of the so-called Main Dolomite of the Upper Triassico ("Dolomia Principale"), a typical Dolomites'rock. The Tofane massif offers a variety of outdoor activities. On the eastern part, above the Ampezzo valley, there is a well known ski resort, where every year also the World Cup races are held. And on the very peak of Tofana di Mezzo a cable car goes. Otherwise in the whole massif there are many other activities, as hiking, Via Ferrata and climbing: in the vertical walls of the massif the hardest climbing routes can be made. 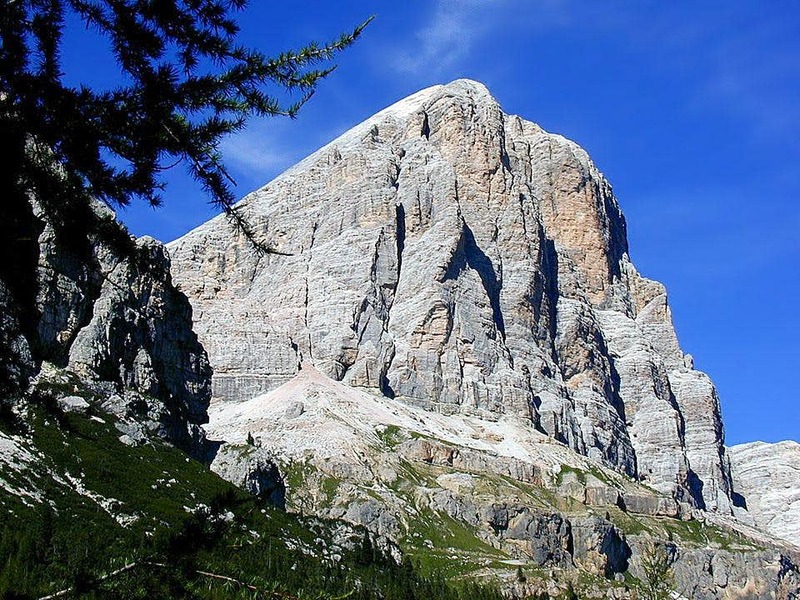 Especially the South face of Tofana di Rozes is monumental, offering the hardest climbing routes. All three main peaks can be ascended by marked routes, but they are far from being quite easy. But now let's concentrate on Tofana di Rozes only. Driving early in the morning from Cortina d'Ampezzo to the Falzarego Pass, you will soon notice a mighty cathedral rose-colored by the first rays of the sun, showing an almost 1000 meters high vertical South wall, consisting of eight distinct pillars. It's Tofana di Rozes. The mountain is like a giant three-edge pyramid, so its West face is very similar - only that it is not so extremely steep. The North-East face is the least steep, but it still holds snow rests long into summer. It fails only a little and there would be a permanent glacier - and may be there it was in the past. Now over the scree of North-East slopes the normal ascent goes. 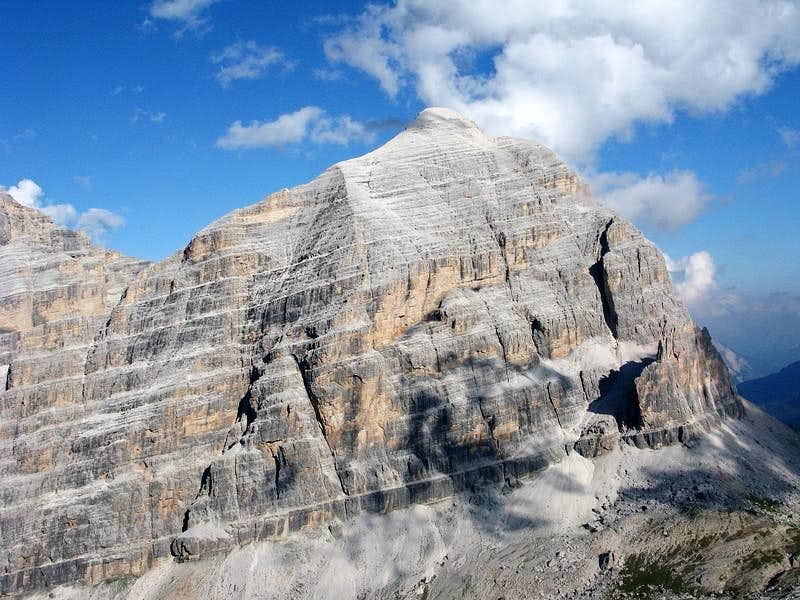 Although not being easy, due to its marked routes, Tofana di Rozes is often ascended. 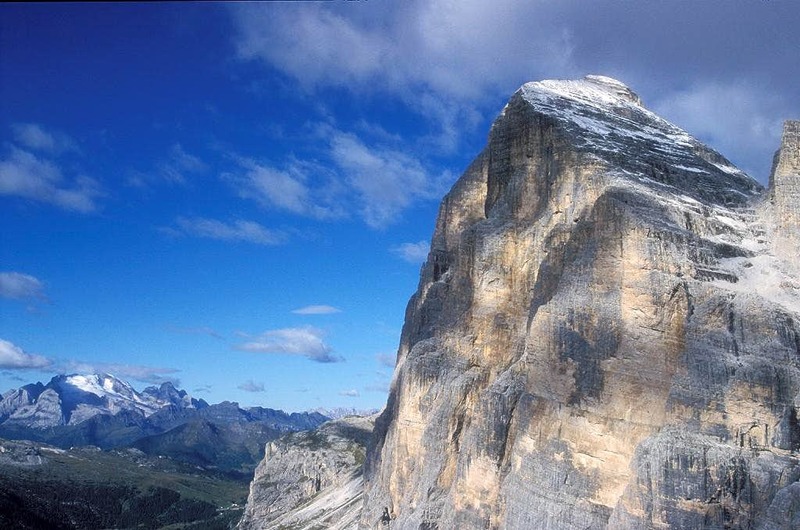 For an experienced hiker it represents one of the most rewarding peaks of Dolomites. Andrej Mašera: As a beginning of the mountaineering history of Tofane group, we can consider August 29th, 1863, when Paul Grohmann reached the summit of Tofana di Mezzo in the company of hunter Checo de Meléres Francesco Lacedelli from Cortina. Next year he ascended with the same Lacedelli and the guides Angelo Dimai and Santo Siorpaès also Tofana di Rozes, and in 1865 with Angelo Dimai Tofana di Dentro. It is interesting that the huge south wall of Tofana di Rozes relatively early attracted the attention of climbers. In 1901 guides Antonio Dimai, Giovanni Siorpaes and Agostino Verzi guided on the wall two well known climbers - the Hungarian sisters Ilona and Rolanda Eötvös. A very interesting classic of the upper UIAA degree IV, still today often visited. Later others came and till WW2 routes of UIAA degree VI were climbed. In the 40-ies the "Pilastro" was brought in focus. Ettore Costantini and Romano Apollonio, the two from "Scoiattoli" group, climbed it in 1942 (in two days), thus opening the "upper sixth grade" difficulty. Even Herman Buhl, one of the first to repeat the route, commented it: "Like a fly on the ceiling I was hanging under the roof, my feet were dangling in the void, 300 meters high above the ground." Even today the south wall of "Pilastro" is considered one of the most difficult and beautiful extreme climbs in Dolomites, rated with VI-/A1 or VII+ in a free climb. And similar climbs were done also in the other pillars of Tofana di Rozes. "Scoiattoli" from Cortina. 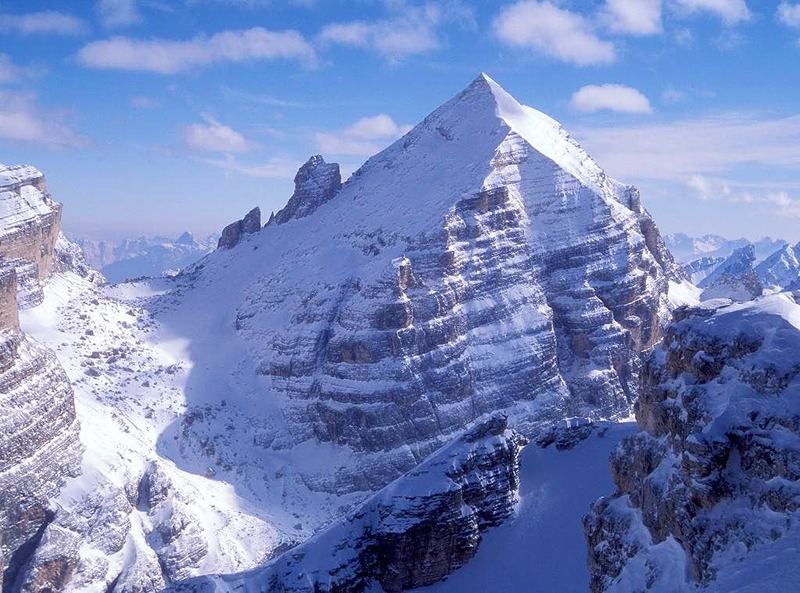 As in some other towns in sub-Alps Italy, also in Cortina a group of climbers was formed in July, 1939. But it soon became legendary. A very capable team, in which there were many sons of old-time climbing legends (such as Dibona, Lorenzi, Dimai, Ghedina, Menardi,...), soon excelled with famous first climbs. Among them were the SW wall of Cima Scotoni, NW edge of Western Zina, firs winter climb over Grand Capucin east face and their member Lino Lacedelli was the first one to climb on K2. In the World war I the front line crossed the Tofane group. That is why in these mountains you can see so many relics of this war - caves and tunnels - and in the surrounding valleys monuments to thousands of soldiers who lost their lives in this beautiful mountain region. During the war the summit of Tofana di Rozes was occupied by Feltrini Volunteers in 1915, September 18th. Andrej Mašera: But one of the most remarkable events happened on the SW corner of Tofana di Rozes. There is an outposted tower, called Castelletto, where Austrian soldiers had well fortified positions, excellently controlling the entry into Val Travenanzes. Italians decided to blow the fortifications up by mining the whole tower. In almost 6 months they dug a 507m long tunnel and placed into its end 35 tons of dynamite. Austrians of course knew what was going on, and were digging their own tunnel in the opposite direction. But too late. On July 11th, 1916, at 3:30 a.m. a terrible explosion blew away the whole summit of Castelletto. Rocks were falling miles around and from the nearby area of Cinque Torri the Italian king himself observed the scene. But the event had no big impact on the course of mountain war. In 1956 through the Italian tunnel the initial part of Ferrata Lipella was made. Click here to see on-line version! The main resort to climb Tofana di Rozes is Cortina d'Ampezzo m 1211. - From Belluno: take the road SS 51 towards North, getting Longarone and Pieve di Cadore; from Pieve the SS51 turns to left, reaching San Vito di Cadore and Cortina d’Ampezzo. Once you get to Cortina d'Ampezzo drive towards the West, following the road SS48 to Passo Falzarego and follow it just after Pocol 1530 m (6 km after Cortina), where you can turn to right on a narrow road, rising to the Dibona Hut m 2083. This hut is the best starting point for the two marked Tofana di Rozes ascents, for the South Wall climbing routes and also for a round tour. - Road approach from Verona, Trento, Bolzano and Brennero: take the Brennero Motorway, exit Ponte Gardena and then follow the Val Gardena road to Selva di Val Gardena and Passo Gardena, reaching Corvara and La Villa. Turn to right towards Passo Falzarego, get the pass and here descent towards left along the road SS48 towards Cortina d’Ampezzo as far as you meet a narrow road on your left side (signpost Rif. Angelo Dibona). Turn to left. reaching briefly the shelter. You can reach the trailhead also directly from the Falzarego pass road. From the Magistrato alle Aque hut (1985 m) just take a marked path No. 412 towards the north-east. The approach through Val Travenanzes is also marked but long and appropriate only for a two-day hike. 1. Ferrata Lipella on the West face. One of the most popular, but long and strenuous ferratas in the Dolomites, which actually encircles more than half of the mountain. 2.The North approach (Normal). In normal (summer) conditions not hard, actually a hike-up, which requires a secure step on some places. Be aware that snow and ice remain for a long time on Normal route northern slopes and can be present even in full summer. In late spring (middle May and June) the Normal route is quite an interesting snow-scramble (ace and crampons required), offering an exciting ascent. In good conditions it can also be done as a hard ski tour. Best time: spring. For those who do not strive only for high peaks it can be done also a splendid round tour, which encircles the whole Tofana di Rozes by a marked path. It typically starts at Rif. Dibona, 2083 m, from where we hike below the South wall of Tofana di Rozes and Castelletto on Forcella Col di Bos, 2331 m. From there we descend into the beautiful Val Travenanzes, almost to the alpine pasture with a hut, 1965. From there two variants lead up into the high Majariè glacial cirque. The first one is the Minighel ladder, Ra Šàra del Minighèl in Ampezzo dialect. It is short, but extremely exposed, going alongside the crystal clear waterfall, Pišandro del Majarié. The other option is much easier, called Majarié path, but it goes around, starting on the Travenanzes alpine pasture. Above the rocky barrier both routes join and you hike up by the high valley to Rif. Giussani, near Forcella Fontananigra, 2580 m. Then only the descent by mule track to Rif. Dibona remains. Just above the base of the South Wall, there is also a cave, arranged for visit. While in limestone, which is easily dissolved by water, caves are a usual phaenomenon, this is one of rare caves in dolomitic rock. The ascent route comes from Rif. Dibona. You follow the marked path to Ferrata Lipella, but reaching the base of Tofana's wall, you deter right up. Steel cables (so, there's a short ferrata) lead you by a ledge and soon you reach the cave. The previous version has been updated on 2014, November 16th, including the most recent routes, dates and authors of the first ascents, other technical details and the description of the two new descent's itinerary from the routes running on the South Wall Pillars, after the landslide occurred in 2011. * Dimai-Eötvos - D+. max UIAA V, 1150 m. - Antonio Dimai, G. Siorpaes, A. Verzi, I. and R. von Eötvos 1901 - Praise to the exceptional intuition of the first climbers, which at the beginning of the twentieth century opened this very long ride through a majestic wall! mvs: "For an adventurous, but not "extreme" climber, the Dimai/Eötvös Route will provide the most rewarding tour of the face"
Descent from the summit - Follow the Normal route towards NW along the sloping Northern crest of the peak. Along scree and easy rocks gain the shoulder where the Ferrata Lipella ends. Here the tracks turn towards NE, reaching Rifugio Giussani (1,30 h. from the summit). Descent from the routes running on Third Ridge, Pilastro di Rozes and First Ridge - These routes don't reach the top of Tofana di Rozes, therefore the descent doesn't follow the Normal route on Northern slopes, but another itinerary. This itinerary changed starting from 2011, September 7th, when a mass of rocks fell onto the path which gives access to the characteristic narrow ledge used to go down to Rifugio Giussani and Rifugio Dibona. This ledge - well known to the alpinists who have climbed on the pillars as, despite not being the only descent, the most frequented way to descend - can no longer be followed. (info by Enrico Maioni, www.guidedolomiti.com). The new descent way: scramble up along steep scree and easy rocks to a saddle located to the left (West) of Punta Marietta (cairns). From the saddle head to North, scrambling down the steep slopes, reaching Rifugio Giussani (45 min.). It's also possible to follow a ledge, used during the Great War - remains of the WWI can still be seen - running below Punta Marietta, reaching a notch between Punta Marietta and Punta Senza Nome, from which a steep slope leads to Rifugio Giussani. Summer and autumn months (July-October) are the most appropriate. In early summer you should count on many snow rests on the northern side of the mountain, so take with you the appropriate gear. In winter conditions ascents by the normal route are also possible, but they require experience and a full winter equipment. And many huts and hotels on the road Cortina - Passo Falzarego. More tourist information you can find on the page of Cortina d'Ampezzo. Say Costantini Ghedina three times fast!